Here we go boys and girls! First Brisket! Posted: Wed Mar 29 06 9:48 am Post subject: Here we go boys and girls! First Brisket! 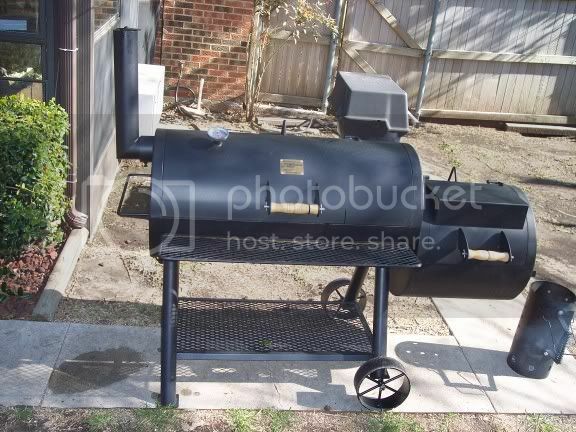 Well, here she is, my new Okie Joes Longhorn smoker and my first brisket. I started it kind of late so I pulled it a little early. I know, I know, I should have waited another hour but, I was STARVING! How do you guys here get such good pictures? Nice job Brad, sorry I missed it. My invitation got lost in the mail, I guess Nice choice in sauce too...I love that stuff! Them look like good eats!!! Yep....nice looking meat Brad..............making me very hungry and VERY happy I am almost done for the day!!!!! I am thinking some que is on the way this weekend. Brad..you live in Texas, how would you rate your brisket? 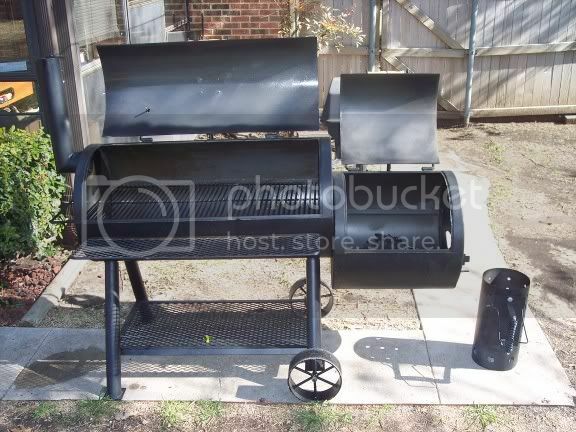 I'm going to fire up my Okie Joe on Sunday to season....did ya do any mods yet? If so..what? What kind of lump was that? Did ya like it? Any wood for smoke? Did you use a rub of your own, or store bought? Last I saw for brisket price in Seattle was 3.19 I know you're probably under 2.00 lb..Did you have any problems on the smoke session? Sorry about all the questions, but I want to be ready for any thing I can! Thanks, any knowhow is appreciated!! Damn nice looking, bro. How much did that one weigh? I'm planing to try my first one very soon. Bellevue is where I was at. I think it's the 3rd weekend in September. Soonerfans.com is the place to check. Small world sometimes Auto!! What do you do for business? I'm on OU Insider, and Soonersports.com most of the time. I don't remember if I've been to that site, I'll have to check it out. You'll have to let me know if you're around again, we can grab a few adult beverages orsomething. BOOMER SOONER!! Mikesooner, I haven't done any mods to the smoker yet. I plan to fashion a length of metal that brings the exhaust stack closer to the grate level. Maybe rig up some sort of difusser for the heat. I'm going to pick up a Maverick ET 73 thermometer and forget about the thermometer that's mounted. It was about 50 degrees off. Other than that, I don't think I'll do much. 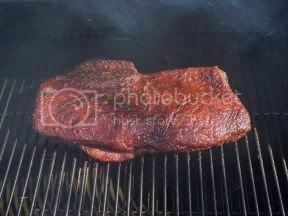 The brisket weighed 9 pounds ($1.30 per pound. ) . I used Royal Oak lump that I picked up at Walmart for $5.27 for 10 pounds. 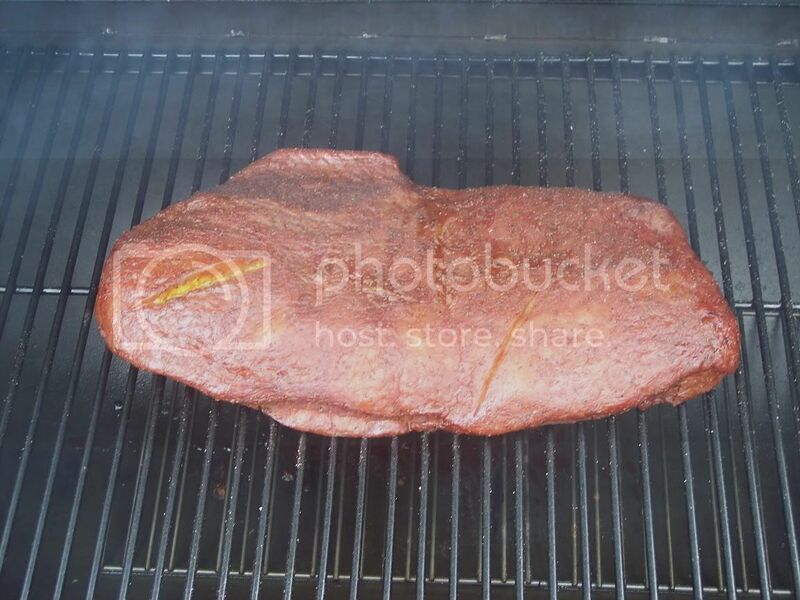 Went through 2 bags or lump and on bag of Hickory chunks through out the smoke. I should have left it on about an hour longer and let rest for about 30 more minutes. Other than that it was great. The rub that I used was store bought from Academy Sports. It was called "Gordon's Grub Rub". I love my smoker. I will be using logs for smoke from now on though. The chunks that I can get ahold of are a little small and burn up really fast. I was throwing in chunks every 30 minutes or so. Good luck with the smoke! I know what you mean about the questions. Ask as many as you want. I'll answer all that I can. Posted: Sun Apr 02 06 6:52 am Post subject: Looks great! 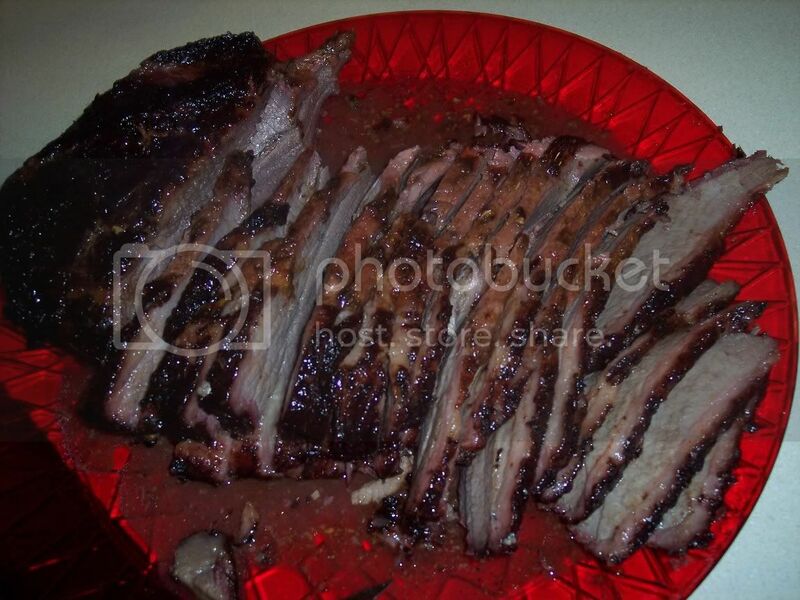 Good looking brisket Brad. And good choice for sauce too. Love that Stubbs. Brad.got a late start on the assembly...was surprised at the small grate for the firebox..saw the lump you had for the brisket..did you use lump for the seasoning? I have a larger charcoal ring for my WSM..think the same amount wouldn't stay on that little grate..I'll work on that...glad you had a great cook!! Hey Brad...think I'll try and find a charcoal "box", like a ring from the WSM.Yeah, some fire bricks may not be a bad idea! I see that you are using one of the grates that come with the smoker. 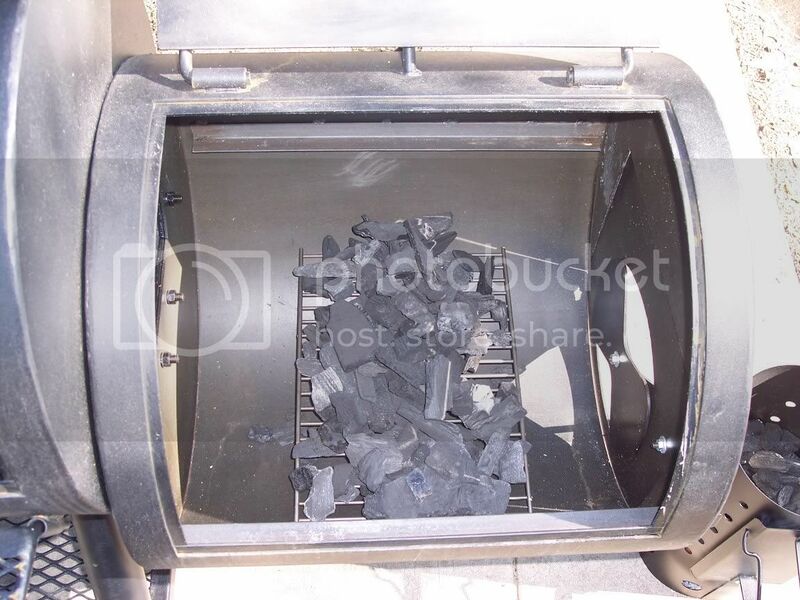 I have the same smoker and if you take two of the lower grates from the smoking chamber and set them side by side in the firebox you will have one continuous grate for the fire. For me it works better that way. You definately need to get the Mav 73. I have tried several gauges that fit the smoker and they were all off by 30-50 degress. Good Luck, I love my smoker.